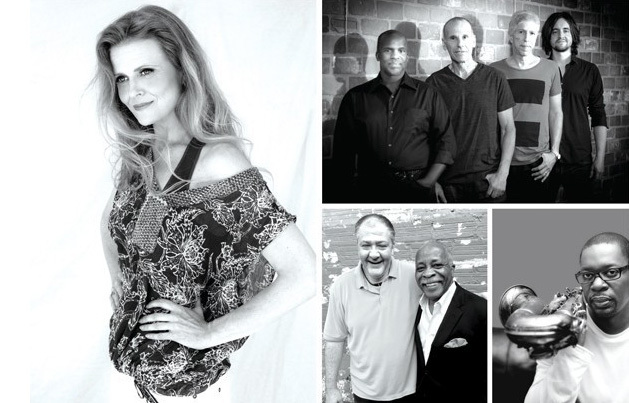 The Riverhouse Jazz lineup includes Tierney Sutton (left), The Yellowjackets (top right), Ravi Coltrane (bottom right) and Mel Brown (center), pictured here with Marshall Glickman, producer of the Riverhouse Jazz series. With Mt. Bachelor and Smith Rock just a short drive a way—and an excess of lakes, hiking trails, and high desert forest areas to explore—Bend is a dream come true for the active, athletic, and outdoorsy. While nature enthusiasts flock to the area from all over the U.S. for camping, climbing, and skiing, Bend has also put itself on the map as a prime destination for jazz aficionados looking for live entertainment featuring big names. This October, Riverhouse on the Deschutes, in partnership with Marshall Glickman, CEO of G2 Strategic, is launching a new jazz series called Mt. Bachelor Riverhouse Jazz. Two shows will run every weekend from October 2016 through April 2017, featuring a combination of internationally recognized and Northwest-based artists. Glickman, who founded Jazz at the Oxford, is excited to be bringing a truly distinguished jazz series to the area. “There’s a lot of live music in Bend,” he says. “I believe it’s big enough to support this kind of show.” He sees both Bend and the recently renovated Riverhouse on the Deschutes as the perfect place for authentic, high-end jazz entertainment. When asked how Mt. Bachelor Riverhouse Jazz will be distinctive, he explains that while still intimate, the venue is a spacious 3,500 square feet, making space for 210 seats and allowing service bars to be located inside the room. Speakers will be suspended from the newly renovated, high ceilings, so views of the stage remain unobstructed. Large sliding glass doors lead to a heated deck overlooking the river, making it easy for listeners to step out and enjoy a quick breath of crisp mountain air. According to Glickman, every detail has been considered in an effort to guarantee guests enjoy the best jazz experience possible. He says, “We’re taking care of details to make sure that this (series) is managed in the most professional way possible.” The Boston Grand Piano that is being delivered by Michelle’s Piano Company in Portland is an example of the extra attention to detail. It will be double-tuned by Bend local, Randy Potter, a special touch that artists and audience members alike will appreciate. Ravi Coltrane Quintet: Ravi Coltrane is a critically-acclaimed, Grammy-nominated post-bop saxophonist. Though he is the son of John Coltrane, Ravi has made a name for himself in the world of jazz and has released six albums as a bandleader. Mel Brown: Sometimes referred to as The Godfather of Portland’s jazz scene, Mel Brown has performed with Motown legends Diana Ross and The Temptations. The Mel Brown Septet brings horn-driven hard bop as well as straight-ahead bebop to the stage. The Yellowjackets: This influential, award-winning jazz-fusion quartet has won Grammys for Best R&B Instrumental Performance and Best Jazz Fusion Performance. Their music is described as a blend of straight-ahead grooves and flowing bop lines with funk and R&B. Additional acts include: King Louie’s Portland Blues Review, the Alan Jones Sextet, and the Benny Green Trio.